With all the votes tabulated, the unofficial results Monday evening show Rawlson King winning in Rideau-Rockcliffe with 18.36 per cent of the vote. 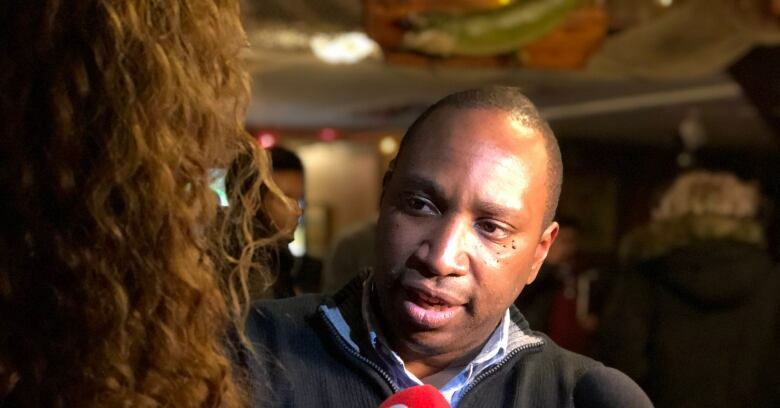 Rawlson King has won the byelection in Rideau-Rockcliffe to replace Tobi Nussbaum, according to unofficial results posted Monday evening. King received 1,529 votes, or 18.36 per cent of the vote, to win over second-place finisher Jamie Kwong, who had 1,406 votes. He would be the first black city councillor in Ottawa's history. As of 2016, black people — Ottawa's largest visible minority group — made up six per cent of the city's population. Official results will be announced by Ottawa's city clerk on Tuesday morning, but unofficial numbers show a turnout of 30.61 per cent. Rawlson celebrated with volunteers and supporters at a pub on Montreal Road where he spoke about his victory. "It's amazing, especially since it went from conception to reality so quickly. That's what's amazing about it. It was an idea that we had I guess late in the year when we heard Tobi Nussbaum was resigning," Rawlson said. Campaign volunteer Rachel Décoste said the victory is a big step forward for Ottawa. "First black person to be elected in Ottawa, whether it's federal, municipal or provincial, this the first time I think. It's a historical moment," Décoste said. Kwong, who finished second in the race, was disappointed with the loss but said it was good to see that a diverse voice would be joining city council. "I think city council could definitely use diversity," she said. Congratulations <a href="https://twitter.com/rawlsonking?ref_src=twsrc%5Etfw">@rawlsonking</a> on your win! I look forward to working with you and to your contributions to Rideau-Rockcliffe and on City Council. I’d also like to thank all those who’ve put their name on the ballot in this by-election - our democracy is stronger because of you. "Diversity of voices, diversity of experiences at city council will make sure that the decisions that get made are more representative for everybody in Ottawa. I think this is a positive addition to city council." King is president of the Overbrook Community Association and a board member at the Rideau-Rockcliffe Community Resource Centre. He is also co-chair of the Ottawa Police Service Community Equity Council. He has lived in Rideau-Rockcliffe for 15 years and graduated from Carleton University with a bachelor of journalism and a masters degree in communications. Seventeen candidates competed in the byelection that was triggered when Nussbaum took a position leading the National Capital Commission. The campaign featured one debate, where 16 of the the 17 candidates took part. The ward is one of the most diverse in the city and includes affluent neighbourhoods such as New Edinburgh and Rockcliffe Park, combined with areas where socio-economic challenges are more obvious, as in parts of Overbrook.